Chicago—Cottonwood, Idaho, is located on the Carnas Prairie (population 910, as per 2010 U.S. Census), 158 miles from Spokane, Wash., the nearest city with more than 100,000 people. It is home to Hoene (pronounced Hay-nee) Hardware Co., a 108-year-old, fourth-generation retailer that sells items including appliances, bedding, furniture and flooring—and is the newest member of the FCA Network. Gus Hoene, owner, said that after buying out his partner last year he wanted to join a group. He started looking online and came upon the FCA Network and Olga Robertson, its president. Hoene said he dialed an 877 number and Robertson immediately picked up. “I was driving and had to pull over to the side of the road because I didn’t think I would get through, and I wasn’t prepared to talk,” Hoene told FCNews. He spoke with Robertson for 90 minutes and verbally committed to joining the group. The Hoene Hardware scenario is not uncommon at FCA Network (except perhaps for the long and winding road traveled), where Robertson and her team are a mere phone call away. FCA Network is not the largest buying group, but to hear its retail members tell it you would be hard pressed to find a more loyal group of dealers. 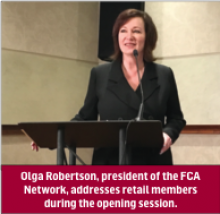 FCA Network, which bills itself as the low-cost buying group with high-powered expertise, is unique in that it is the only retail group actually run by retailers (it has its own corporate stores). 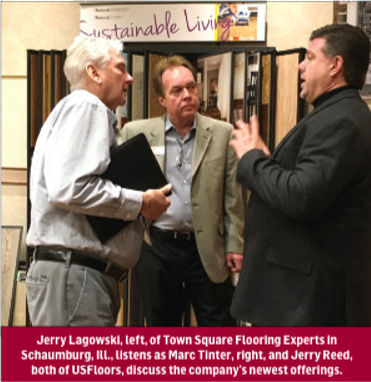 The group, an offshoot of Floor Covering Associates, a $40 million-plus retailer based in Shorewood, Ill., was launched in 1998 with the goal of assisting independent retailers in expanding opportunities through marketing, merchandising and buying power. Ninety percent of membership attended the Chicago event, which is par for the course, and yet a rather significant statistic considering the conference is not mandatory. “Our members are here because they want to be here,” Robertson said. “They are committed to this business.” As with everything with this group, no program or product is mandated; retailers remain autonomous in how they want to run their business. FCA Network is there to provide the necessary support through professional assistance.